In the last year, we as a family have smashed the iPad screen twice.Once by Harry standing on it and once by me dropping it on the concrete slabs in the back garden ( shamefully taking selfies ). Both times we have had covers on the iPad which obviously didn’t work !! We were in need of an industrial strength version and by chance, the lovely people at tech21 asked if I would like to review their new cover for our iPad Air 2. 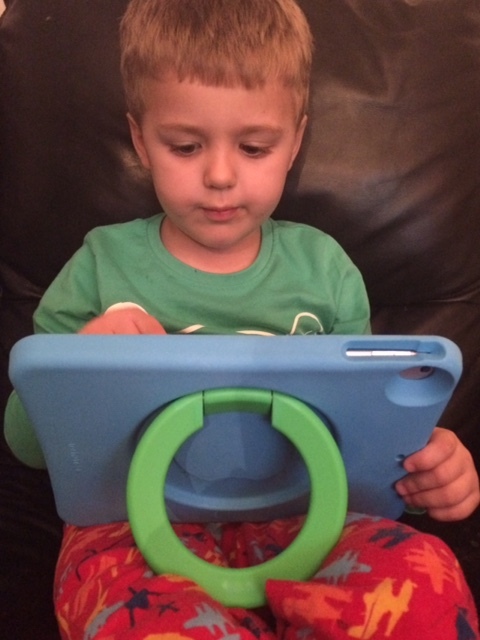 The cover comes in Blue/Green or Pink/Purple having given Harry the choice he went for Blue/Green (gender-neutral and all that ) The case is made out of FlexShock™ Foam which is durable enough to get your Ipad into but tough enough to withhold dropping it ( from 2m’s it states). It has a large carry handle on the back of it which also doubles up as a multi-angle stand. A very clever feature is that the case is dishwasher friendly up to 60 degrees so you can keep it nice and clean and it’s bite resistant ( perfect for when a teething Charley gets her hands & teeth on it ). Now to test it out with Harry. I thought the best way was to ask him some questions about the Evo Play Case. What do you think of the colour? Good colour, I like the colour a lot. It’s very blue and I like blue. How does it feel in your hands? It feels squishy on my hands, like jelly. What do you think of the handle? I like it, it’s big and I can carry it around with me. 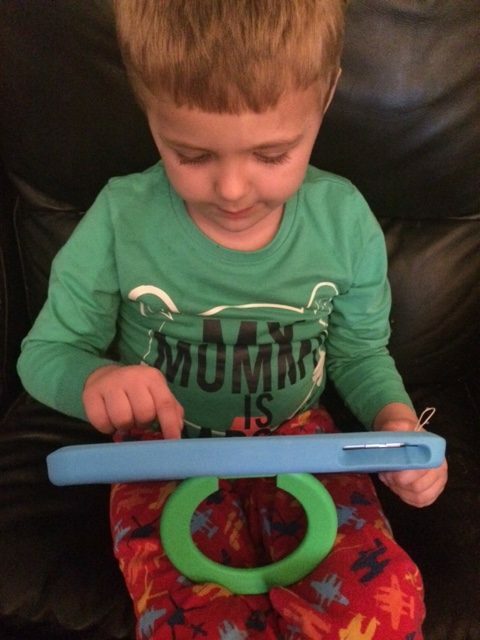 Can you use the iPad easily when the case is on? Yes, it’s cool. How could it be better? It could have Iron Man on it. Well, it’s a thumb up from Harry and a big thumbs up from me. I would have saved myself £120 on new screens if I had purchased this case instead of buying a cheaper version.The Evo Play Case is available to buy through the tech21 website at £59.95 and in my opinion worth every penny for the stress and cost of having to send your iPad off for repair.They also offer a range smartphone & Macbook covers to suit all models starting from £24.99 so I will be upgrading my ebay £2.99 cover to a tech21 before my phone screen suffers the same fate as the iPad.Every so often you come across a company that just makes simple solutions to your everyday problems and you wonder how you ever got by without them. In tech21 I have found a solution that lets me allow Harry to use the iPad without the fear of another costly repair bill. My overall score is 10/10. 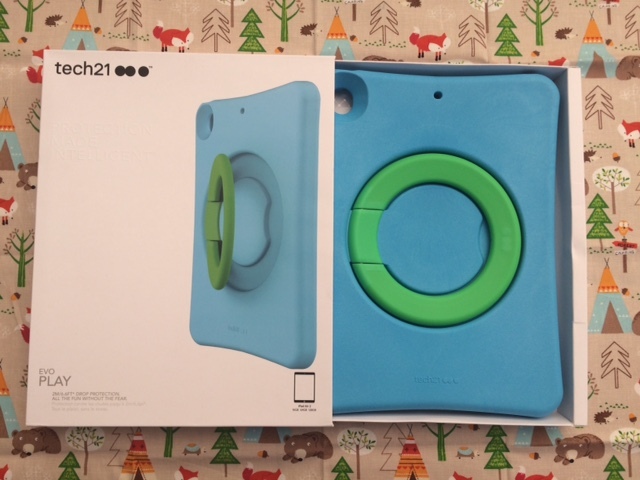 *The Evo Play Ipad Air 2 Case was sent to me by tech21 for the purpose of the review but all thoughts and comments are my own. "TODAYS MOMENT IN TIME #4"